Robot Merge is the cool new merging game from Umbrella Games. If you are familiar with the genre, then you'll pretty easily become accustomed to what you have to do in this game. Basically you drag the same robots onto each other to develop them to higher levels. This game though is a little different. 1. 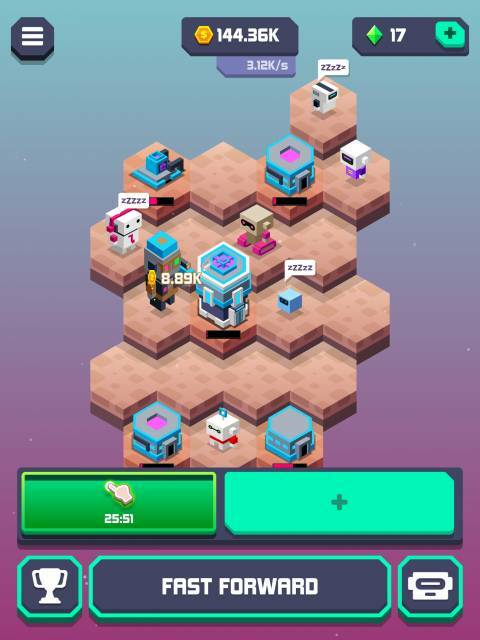 There is limited space on the playing field so assign your the new spaces that you earn to positions next to the workstations so they are completely surrounded so you can assign the maximum number of robots to each workstation. 2. Upgrade each workstation by dragging more robots next to them. The higher the level of the robot, the more they will add to the development of the workstation.